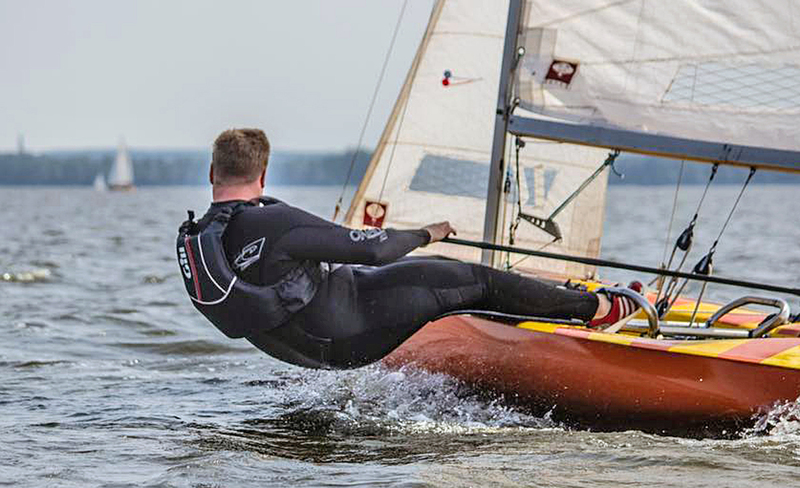 The previous header photo is of the athletic, full-on hiking skipper powering the modern German Taifun sailing canoe upwind. The Taifun is a racing canoe class that is the only extant sailing canoe that has similar dimensions to the original English B-class sailing canoe of the early 1900's. "The sailing canoe is one of the representatives of the small sailing craft with elegant, sleek lines. 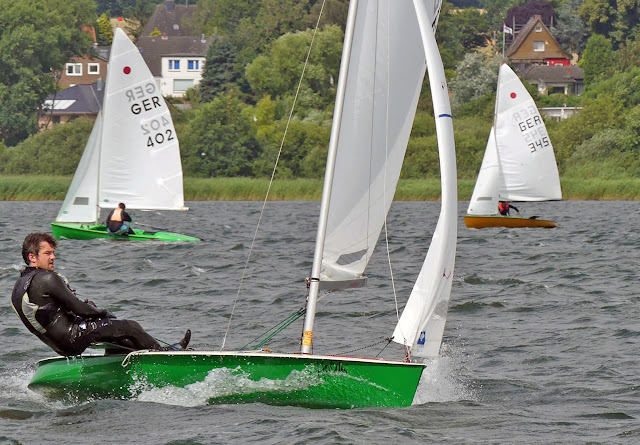 Early on, the most frequently built was the 7.5 square meter sailing canoe of the German Canoe Association. There were Rundspant, Knickspant- and Doppelknickspant boats. They are 5.20 m long, sloop, and were sailed by one person. The sail logo of class was a red dot. Typical for the boats is the Spitzgat shape - the double-ended shape of the sailing canoes. The 7.5 square meter sailing canoe was a restricted design class where the length of the boat, the sail height and sail area were fixed. Many different sailing canoes were built to this rule and the most up-to-date knowledge in small boat construction was adopted. However, the variety of types made a large spread in speed and finishers in regattas were very spread out. "From an issue of the "Yacht" (1951, Issue 6, p.133): "The Bremer, after seventeen years of experience in the design and building of sailing canoes, five years after the end of the Second World War, developed a type 'Bremen" canoe, a 7.5 square meter racing and hiking canoe- and they have achieved a certain standard form, which has proven an excellent sailing craft. The boat has a "spoon bow", the underwater shape has no hollow lines, so that it does not hobby horse, and remains dry even in heavy weather Of course, it is equipped with all the latest technical finesse, the canoe is light, fast, stable - and in combination with a large cockpit it is not only a superb racer, but also an ideal hiking boat.The owner with wife and 1-2 children can sleep comfortably in the long cockpit. 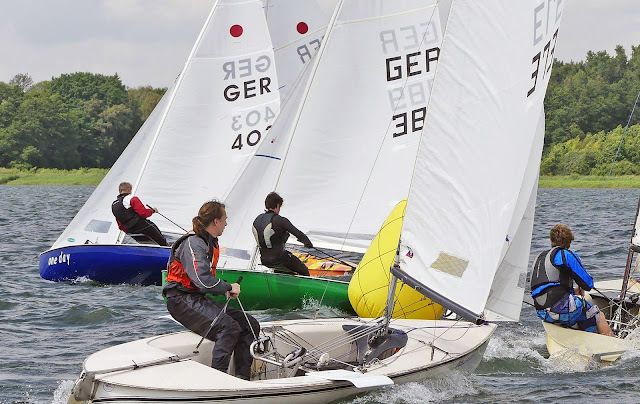 The cockpit can of course be covered except for a small opening- which has proved to be unnecessary even in hard regattas and heavy waves on the lower Weser from Bremer Werft to the DM 1000.-. " The designer of the 7.5 square meter sailing canoe type "Bremen" was Walter Mater. As a trained boat builder, he worked in the post-war years as a part-time home builder. He himself operated a small boatbuilding company in Bremen before the war began. Later (about 1963) he developed a motor canoe. In 1985, Walter Mater died at the age of 77 years. Drawings of his canoes, Canadian paddling canoes and regatta dinghies were sent to a large number of interested parties and clients at the time. On the Hamme near Bremen, the German Championships took place in 1955 in the 7.5 square meter sailing canoe. However, there were only 10 boats. In 1956 the 7.5 square meter class were up to 17 boats from Bremen, Westphalia and southern Germany. In 1964/65, the Taifun, based on the Bremen canoe, was introduced - a further development that included short hiking boards, to enable more hiking leverage on this narrow hull. The boat numbers G1 to G 99 are 7.5 square meters sailing canoes, numbers G 100 and up are Taifun's. The Taifun was a one-design, and the old 7.5 restricted rule class was abolished. As can be read in an issue of the "Yacht" from 1963: "Unanimously, the German Canoe Association decided in the autumn of 1963, the introduction of a standard sailing canoe The existing free design class is no longer allowed New builds and basic conversions of the 7.5 square meter canoe will no longer be measured ... From this standardization, the German Canoe Federation promises to intensify canoe sailing on a national and international level. " Some photos of the Taifun class racing. The Taifun sports little hiking seats to get the skipper out further. 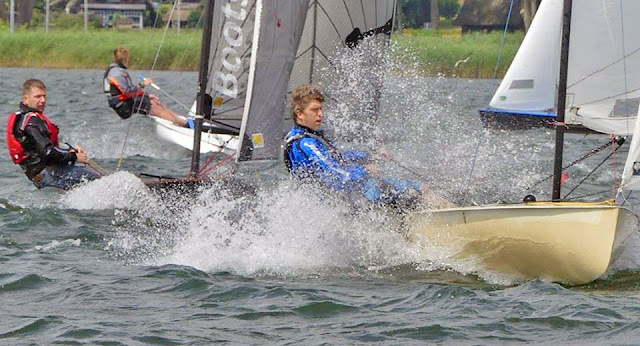 Juniors race the Taifun two-up; after age 19 the Taifun is a singlehander. Some videos of the Taifun are over at this post.